A cerebrovascular accident results from loss of oxygenated blood to a region of the brain and is typically accompanied by neuronal loss. A stroke, or cerebrovascular accident (CVA), is the rapid loss of brain function due to disturbance in the blood supply to the brain. Different types of strokes have different underlying causes. Stroke is currently the second leading cause of death in the western world. The most important modifiable risk factors for stroke are high blood pressure and atrial fibrillation, although other risk factors can also be modified to decrease risk. embolus: An obstruction causing an embolism: a blood clot, air bubble, or other matter carried by the blood stream and causing a blockage or occlusion of a blood vessel. thrombosis: The formation of thrombi in the blood vessels of a living organism, causing obstruction of the circulation. embolism: An obstruction or occlusion of an artery by an embolus, that is by a blood clot, air bubble, or other matter that has been transported by the blood stream. Examples of risk factors for stroke include high blood pressure, high cholesterol, diabetes, cigarette smoking, lack of physical activity, and obesity. The physical disabilities that can result from stroke are varied and depend on the severity of the stroke and the affected areas of the nervous system. Examples of possible disabilities caused by stroke include loss of motor control, muscle weakness, numbness, appetite loss, speech loss, vision loss, and pain. A stroke, or cerebrovascular accident (CVA), is the rapid loss of brain function(s) due to disturbance in the blood supply to the brain. This can be due to ischemia (lack of blood flow ) caused by blockage ( thrombosis, arterial embolism ) or a hemorrhage (leakage of blood). As a result, the affected area of the brain cannot function, which might result in an inability to move one or more limbs on one side of the body, inability to understand or formulate speech, or an inability to see one side of the visual field. 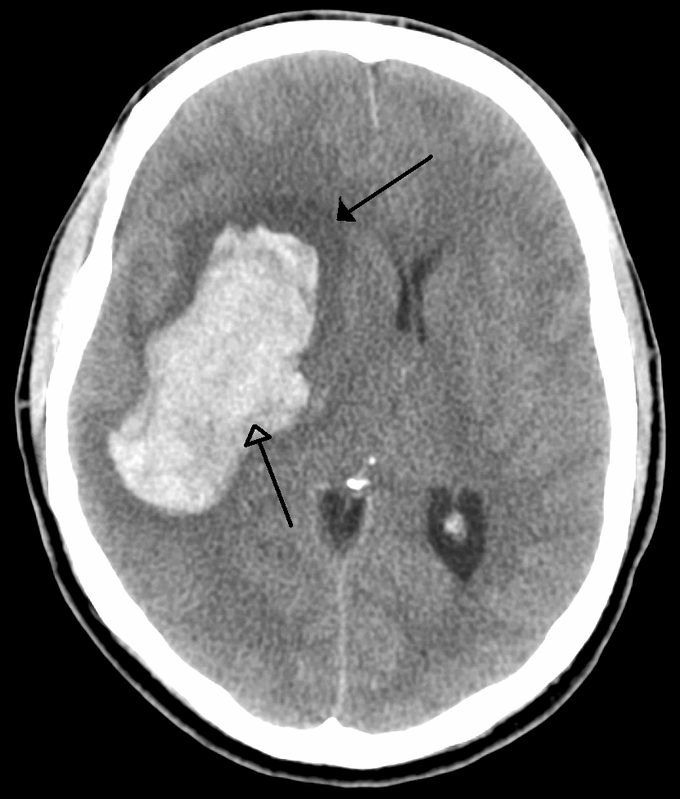 An Example of a Stroke: A intra-parenchymal bleed with surrounding edema. A stroke is a medical emergency and can cause permanent neurological damage, complications, and death. It is the leading cause of adult disability in the United States and Europe and the second leading cause of death worldwide. Risk factors for stroke include old age, hypertension (high blood pressure), previous stroke or transient ischemic attack (TIA), diabetes, high cholesterol, cigarette smoking, and atrial fibrillation. High blood pressure is the most important modifiable risk factor of stroke. An ischemic stroke is occasionally treated in a hospital with thrombolysis (also known as a “clot buster”), and some hemorrhagic strokes benefit from neurosurgery. Treatment to recover any lost function is termed “stroke rehabilitation,” ideally in a stroke unit and involving health professions such as speech and language therapy, physical therapy, and occupational therapy. Prevention of recurrence may involve the administration of antiplatelet drugs such as aspirin and dipyridamole, control and reduction of hypertension, and the use of statins. Selected patients may benefit from carotid endarterectomy and the use of anticoagulants. Different types of strokes are caused by different mechanisms. In thrombotic stroke a thrombus (blood clot) usually forms around atherosclerotic plaques. Since blockage of the artery is gradual, onset of symptomatic thrombotic strokes is slower. A thrombus itself (even if non-occluding) can lead to an embolic stroke if the thrombus breaks off, at which point it is called an ” embolus.” Two types of thrombosis can cause stroke: large vessel disease involves the common and internal carotids, vertebral, and the Circle of Willis. An embolic stroke refers to the blockage of an artery by an arterial embolus, a travelling particle or debris in the arterial bloodstream originating from elsewhere. An embolus is most frequently a thrombus, but it can also be a number of other substances including fat (e.g., from bone marrow in a broken bone), air, cancer cells, or clumps of bacteria (usually from infectious endocarditis). Systemic hypoperfusion is the reduction of blood flow to all parts of the body. It is most commonly due to cardiac pump failure from cardiac arrest or arrhythmias, or from reduced cardiac output as a result of myocardial infarction, pulmonary embolism, pericardial effusion, or bleeding. Hypoxemia (low blood oxygen content) may precipitate the hypoperfusion. Cerebral venous sinus thrombosis leads to stroke due to locally increased venous pressure, which exceeds the pressure generated by the arteries. Infarcts are more likely to undergo hemorrhagic transformation (leaking of blood into the damaged area) than other types of ischemic stroke. A silent stroke is a stroke that does not have any outward symptoms, and the patients are typically unaware they have suffered a stroke. Despite not causing identifiable symptoms, a silent stroke still causes damage to the brain and places the patient at increased risk for both transient ischemic attack and major stroke in the future. Conversely, those who have suffered a major stroke are at risk of having silent strokes. Given the disease burden of strokes, prevention is an important public health concern. Primary prevention is less effective than secondary prevention (as judged by the number needed to treat to prevent one stroke per year). Because a stroke may indicate underlying atherosclerosis, it is important to determine the patient’s risk for other cardiovascular diseases such as coronary heart disease. Conversely, aspirin confers some protection against first stroke in patients who have suffered a myocardial infarction or patients with a high cardiovascular risk. The most important modifiable risk factors for stroke are high blood pressure and atrial fibrillation (although magnitude of this effect is small). The evidence from the Medical Research Council trials is that 833 patients have to be treated for one year to prevent one stroke. Other modifiable risk factors include high blood cholesterol levels, diabetes, cigarette smoking, heavy alcohol consumption, and unhealthy diet.